It feels like barely even a month ago that Kliff Kingsbury departed his head coaching gig at Texas Tech and arrived at USC to be the Trojans’ new offensive coordinator. But now, after a remarkable run that saw USC go 0-0 and Kingsbury’s offense put up #DIV/0! yards per game, the 39-year-old is headed to Arizona, where he’ll reportedly be the new head coach of the Cardinals. Kingsbury was a standout quarterback at Texas Tech and then hung around the fringes of the NFL for a few years before becoming a coach. He was an assistant at Houston and Texas A&M, and then became head honcho at his alma mater in 2013. In six seasons, he went an underwhelming 35-40 with one bowl victory in his debut year. 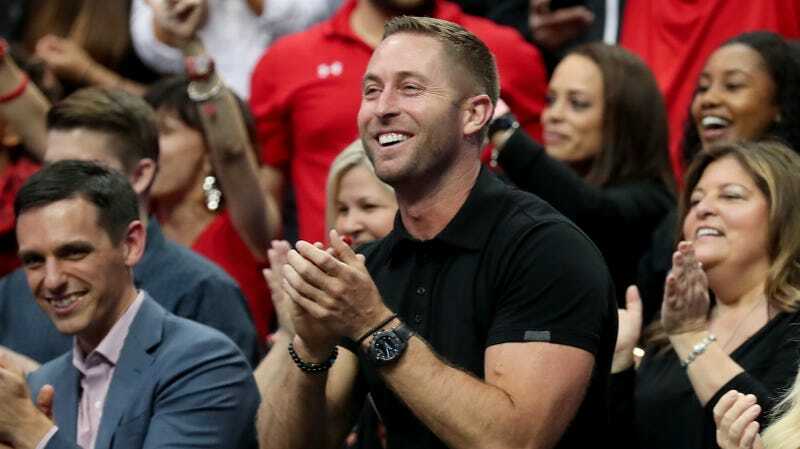 But Kingsbury’s well-liked by NFL teams not only for his youth, but also for his experience working with a cadre of future pro quarterbacks, including Patrick Mahomes, Baker Mayfield, and Case Keenum. Mayfield, however, appears to hold an understandable grudge against Kingsbury for ghosting him after an MCL injury, and eventually refusing to offer the former walk-on a scholarship, leading the soon-to-be Heisman winner and first-overall pick to transfer to Oklahoma. The Cardinals, who went 3-13 last year and have the first overall draft pick this spring, hope that Kingsbury gets on better with their own young quarterback, Josh Rosen. In order to make the move to the NFL, Kingsbury was reportedly going to pay his own buyout at USC. You’d think after all he did for that school, they could have picked up the tab.